If you’re following along, this is the fifth installment of book-turned-TV reviews. You can find all the posts in this series, and my previous series about books-turned-movies, here. Oh, Alice Hoffman, how little I know you. Years ago I watched the movie “Practical Magic” but had no clue it was attached to a book, but when I read the description for CBS’ mini-series “The Dovekeepers” earlier this year, I wondered why on earth I’d never read anything by Hoffman. Spoiler alert: I am hooked. Hoffman’s storytelling is riveting, haunting and as magical as the spells her characters create. This story of four Jewish women in the desert stronghold Masada after the fall of Jerusalem in 70 C.E. is historically informative and narratively imaginative. My favorite kind of historical fiction weaves these two things together in a beautiful pattern, and The Dovekeepers is now counted among this class of story. Their struggles and choices, made in the moment for the sake of survival, are painful and heartbreaking and raw at times, but I left this book with a greater appreciation of first-century Jewish women. Though Hoffman writes with a spiritual, but not necessarily Judeo-Christian, emphasis, there is beauty in the ancient practices she describes. After reading the book, which was not an easy or light read, I was eager to watch the mini-series. Unfortunately, it fell way short for me in comparison to the book. This is not a new feeling for books-to-movies or books-to-TV. Books, in general, are usually richer and have more depth than their on-screen counterparts. Writing a story for the screen requires different elements, I know, and a two-episode mini-series can’t capture everything in the book. Still. I think I expected more. If you read last week’s post about “A.D. : The Bible Continues,” you’ll know that I was impressed with that Roma Downey/Mark Burnett production. “The Dovekeepers” is also one of theirs, but it is more violent and contains more sensuality–which are both in the book–than the Bible series. Let that be a warning. Some aspects of the plot were changed for the sake of time, I think, but even the ending was different. That kind of annoys me. The book follows four women on their Masada journey; the mini-series focused on three. The most surprising characteristic of the mini-series was Sam Neill as Flavius Josephus, Jewish historian for the Romans, who in this story recorded the events of Masada through interviews with two of the women. Sam Neill is a cowboy or lawman in my mind. To see him in this role was interesting. If you’ve seen the mini-series, I’d recommend you read the book to get the real story. If you haven’t seen the mini-series but have read the book, don’t bother. It didn’t add much to the book for me. If you’ve got books-to-TV or books-to-movie recommendations for me, I’d love to hear them! Let me know what you think of this series and whether you’ve tried any of the books/TV shows mentioned this month. This is the fourth post in this series about books-turned-TV-shows. You can find the current series, as well as a series of posts I wrote a few years ago about books-turned-movies, here. Okay, technically this isn’t a review of the ENTIRE Bible because that would be a massive undertaking. The Bible is a collection of more than 60 “books” and because of a TV series that aired recently, this is a look at part of one of those books: the book of Acts. A.D.: The Bible Continues aired on network TV this spring, and I was skeptical at the start. A lot of movies or TV shows I’ve seen that attempt to dramatize the stories in the Bible turn out cheesy or present themselves as unprofessional. There were no spoilers, per se, in the series, but the drama was still intense. Throughout the series, we see hints of the internal journey of the Roman centurion Cornelius. We see Saul bent on destroying the Christians followed by his miraculous encounter with Christ and the complete 180 turn his life takes as he becomes the apostle Paul. When I read these passages in the Bible now, or when I read Paul’s letters, I visualize these actors and their voices, which make the words more than ink on a page. They feel more like a letter or a story when I can picture the person who penned the words. I can enthusiastically recommend this series for watching. Even if you care nothing for the Bible, this series is a good historical drama set in first-century Judea. When an artistic interpretation of a historical event or time period makes me want to know more about that event or time period, I consider it a success. Sadly, NBC canceled this show after its 12-episode run, but I’ve read that some of the next planned episodes are already being written. I hope there are more series like this in the works from Burnett and Downey. 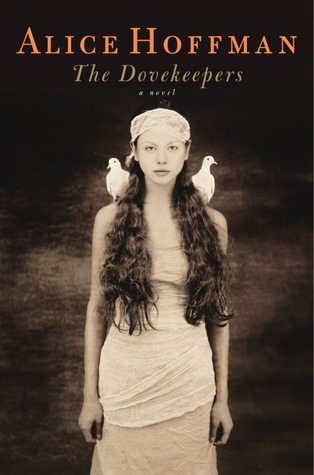 Next week, the final post in this series, The Dovekeepers by Alice Hoffman. So, it’s Holy Week, and a lot of people are writing about it, and I’m not sure I have anything meaningful to say about it. In fact, sometimes, I’m not sure what to do with Holy Week. I’m still relatively new to the church calendar and its seasons and I always want Lent and Holy Week to be special and sacred and yet I often fail to plan for either one. I find myself wondering during Holy Week why we continue to tell the story of these days. Why we commemorate Good Friday when we know how it ends on Easter. And I know there is purpose in the telling and telling again because we forget and we need to pause and remember. But there always seems to be a lot of pressure to tell the story in a new way, to host an event or draw a crowd. Easter is a BIG DEAL for Christians and churches and it lasts far beyond Sunday morning, though I forget that, too. In the midst of regular life–school and work and grocery shopping and laundry–Holy Week breaks in. It’s a curious story from start to finish. The shouts of “hosanna.” The washing of feet. The breaking of bread. The talk of a new covenant. The betrayal. The trial. The crucifixion and death. The hopelessness and the waiting. The miraculous resurrection. It’s an emotional roller coaster when you think about how it played out the first time. It helps me to remember that life is like that, too. Expectations. Thrills. Disappointments. Death of dreams. Questions and doubts. Miracles. Unimaginable newness. I have to look hard in the Gospels to find those emotions and themes. Sometimes the story is too familiar. So, I’m grateful when creative people can take familiar stories and rethink them. I’ve mentioned this before with biblical fiction books. And we recently had the chance to visit Sight and Sound Theatre in Lancaster to see Moses on stage. I come away from these experiences with a better understanding of biblical times. And it happened again this week when I received the chance to watch the first episode of the upcoming TV series “A.D. The Bible Continues” through a perk from Klout. Now, I missed the previous TV series about the Bible, but I heard great things about it. This is the continuation from Mark Burnett, Roma Downey and company, and while I was a bit skeptical (because sometimes the Bible on the big screen is cheesy or overly dramatic or just terribly done), I have to say that if the first episode is an indicator, then this will be a good series. The show premieres on Sunday on NBC, which is not coincidental timing, I’m sure, being that it is Easter, but the televised story begins on Good Friday. I almost wish you could watch it before Sunday because the horror, shame and despair of Good Friday and the following day come through. The disciples are beyond disappointed. Confused. Unable to hope even when Mary begs them to wait at least three days before giving up. It is powerful and beautiful. I love seeing historical settings as they might have been. 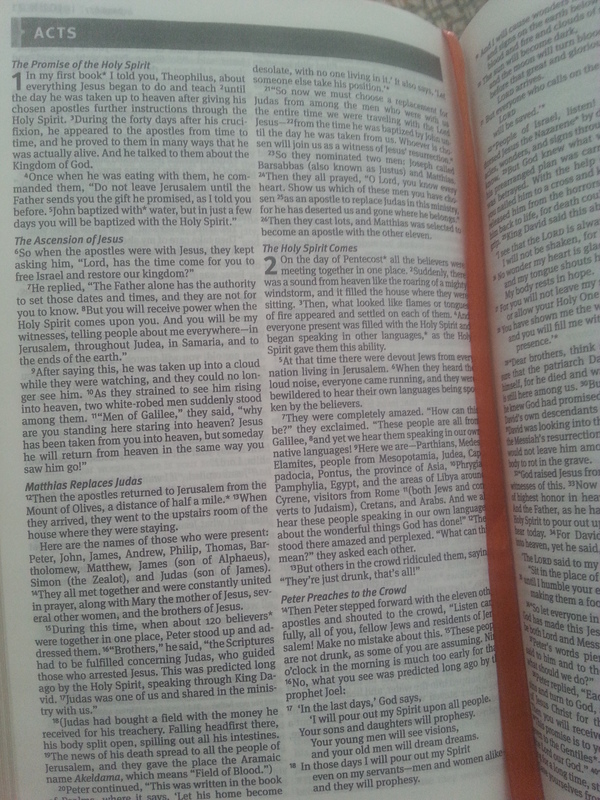 They help me to fill in the details the Bible leaves out and give me access to a world I otherwise couldn’t enter. Like the clothing the elite women (Pilate’s wife and the High Priest’s wife) wear. It’s colorful and extravagant, almost reminiscent of medieval clothing. I forget that the rich and powerful would dress differently than the others, even in a culture from 2,000 years ago. The diversity of characters reminds me that it was a diverse culture. Not primarily Caucasian. And not all young or old. Peter and John and mother Mary and Mary Magdalene all look different than I would have imagined them. And that’s a good thing. And the words that aren’t recorded in the Bible give depth to the characters. One line that sticks out to me is one Peter says the day after Jesus is crucified. What difference does any of this now make that he’s dead? This is the question I must ask myself. What difference does Jesus’ death make? And what difference does His resurrection make? I look forward to watching the second episode because the first ends on a hopeful note but doesn’t take us all the way there. Hope is hard sometimes, especially when all we see is death and chaos. I can hardly read news stories or scroll through Facebook without feeling like the world is one super messed up place and what does my faith matter anyway? What difference does it make? Holy Week reminds me that despair is not the end of the story. That hope is hard when you don’t know the ending. But hope and love and life are coming and I can be a part of that story. I don’t know where this series is going to go, but I know from reading the New Testament that the resurrection doesn’t mean happily ever after, either. If anything, the disciples’ lives become more difficult. But because they have a reason, because they see the difference Jesus’ life and death and resurrection make, they no longer live without hope. That is why we tell and retell the story. Because we live in a world without a lot of hope. And we who believe Christ died and Christ is risen are hope-bearers in this world. Hope, even when it’s hard, makes all the difference. For more about the TV series, go to http://www.nbc.com/ad-the-bible-continues.